Describing a sno-ball is tricky. Most of the country visualizes a snow cone, chunky ice in a paper cone drizzled with rainbow colored syrup. 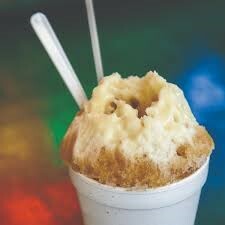 But for all those who aren’t local New Orleanians, let us be very clear: that is not a sno-ball. So then, what, you may ask, is a sno-ball? This seasonal treat is super-finely shaved ice (emphasis on the finely) served in a variety of sizes and containers, topped with specialty syrups and possibly a signature add on, such as condensed milk or in some cases booze! A classic snow-ball served with both spoon and fork. The sno-ball’s humble beginnings came from street peddlers around 1911 scraping ice off blocks with carpenter shaped hand tools. A laborious and not exactly hygienic process, there was plenty of room for improvement. Fast forward to 1936 when two independent machinists almost simultaneously invented a machine that would shave a cup of ice in less than 10 seconds. George Ortolano and Ernest Hansen are credited with the first iteration of the electric sno-ball machine. Ortolano went on to manufacture these machines for commercial use as well as marketing a line of syrups. Hansen on the other hand built a family business where a newer version of his machine is used daily at their neighborhood stand, Hansen’s Sno-Blitz. Ernest Hanson, was originally employed along the docks of the Mississippi. He spent some well-earned evenings tinkering with an electrically powered appliance that would transform a block of ice into finely shaved snow. The source of his inspiration was his spouse, Mary, who had reservations about the cleanliness of the local sno-ball vendor’s hand operated practice. Once the machine was up and running, Mary took it from there. “There are no shortcuts to quality” was Mary’s slogan, meant to justify the 2-cent price tag on her icy confections, which was twice the going rate. She sold from her front porch to the neighborhood and beyond before they had their first store. The Hansen children grew up in the business, and helped to move the store to a few locations around town before settling on the corner of Tchoupitoulas and Bordeaux Street. The custom flavored syrups are a protected family secret, and every year brings a new addition. Hansen’s is now lovingly run by the granddaughter of Ernest and Mary, Ashley Hansen. Hansen’s is best known for it’s creative signature syrup combinations like Ginger-Jalapeno and Charred Peach. Also, notably, James Beard awarded Hansen’s Sno-Blitz a place in their American Classics category. The SnoWizard machine rolled in a different direction. Local grocery store owner George J. Ortolano began manufacturing his machine for himself and others. Although SnoWizard has a store front on Magazine St. their corporate operations is located on the outskirts of Orleans Parish. Ronnie Sciortino bought the company in 1981 and now employs as many as 14 staff members. Machines sell for about $2,000 or an entrepreneurial package with everything necessary to launch your own stand comes in at a cool $10,000. The other side of the business is cooking up some of the 150 signature flavors SnoWizard offers. Most recently a dill pickle flavor born out of a strange consumer inventions of pouring the pickle juice from the jar onto their sno-balls! If you think about it, operating a sno-ball stand is nearly recession proof. At $1.50-3.00 for a standard treat, who can’t afford to indulge in any economy! The real way to taste the rainbow! Start with your size, depending on where you are you might get a pail at William’s Plum Street, a Styrofoam cup at Sal’s, or a signature souvenir cup at Hansen’s. Pick your flavor— here’s where you can get creative or go old school. Choose popular fruit flavors or combine a few and make your own flavor like apple and caramel. Watch as your sno-ball is carefully crafted with just the right amount of sno and syrup. It’s got to be good to the last icy bite. Then go wild and add fruit toppings, condensed milk, or marshmallow crème! Sno-La in Metairie stuffs their cool and creamy sno-balls with cheesecake, two favorites in one. The alternatives are as endless as the imagination. Many of the local vendors also offer nachos, hot dogs, and meat pies, a one stop summer meal with some tradition on the side. The best part is you don’t have to travel far these days to indulge in a sweet afternoon treat. Almost every neighborhood has an option within a short walk, and you will likely commune with an old friend or a new one as you wait your turn to place an order, it’s part of the experience. Don’t delay, sno-ball season is over in September, and you’ll have to wait until March for your next one.